NorCal born, Las Vegas raised Michael Manfredi a.k.a. MANSHN combines his amazing vocal gift, melodic dexterity, razor sharp production chops and genre-breaking arrangements to create an EDM bridge that blurs the lines between conflicting musical origins. His fascination with live performances and passion for dance music culture are evident in his powerful brand of unique electronic anthems that transcend boundaries; propelling listeners into MANSHN's multi-dimensional, sonic universe! "Utopia" is a showcase of seismic proportions, seamlessly melting sensibilities of Orchestral, Metal, Acoustic, and Electronica into a cinematic tempest that's emotive, futuristic and down right explosive! Act 2, the legendary French producer Arkasia transforms "Utopia" into a surreal subsonic firestorm! Arkasia's music fronts a level of maturity and understanding rarely seen in the EDM world. A sublime sense of space, structure and flow gives his sound a refreshing point of difference. His monstrous compositions are moving, powerful and uplifting, enchanting and haunting, and touch the very depths of your soul. Arkasia's musical calling came at the tender age of five when he mastered the violin, and continued well into his teens where he was composing mini-operas by age 15. His broad musical roots and experience playing in both orchestras and metal bands is evident throughout his compositions, however his creations reach far beyond the realms of Classical and Metal, IDM, Dubstep and Drum&Bass into uncharted territories! Arkasia's "UTOPIA" experience starts with a gentle orchestral intro, hypnotizing you, pulling you in deep, to the point of no return; next a twisting onslaught of metal inspired mayhem sweeps you to the brink of manic bliss! Act 3 introduces Oakland, California's very own Medikate! Medikate cranks out peak hour bangers like it's nobodies business, and his refined, tear-out dance tracks have garnered support from dance music icons like Fedde Le Grand, Bass Kleph, Yves V, Marco V and many more! Medikate's gift for making dance music that uplifts your soul is baked directly into his roof raising beats, every track he touches is designed to jump start the dance floor and electrify you from head to toe! On "UTOPIA", Medikate cranks up the pressure with a devastating Hardstyle stomper that brings flames to the game, and scorches sound systems from top to bottom! 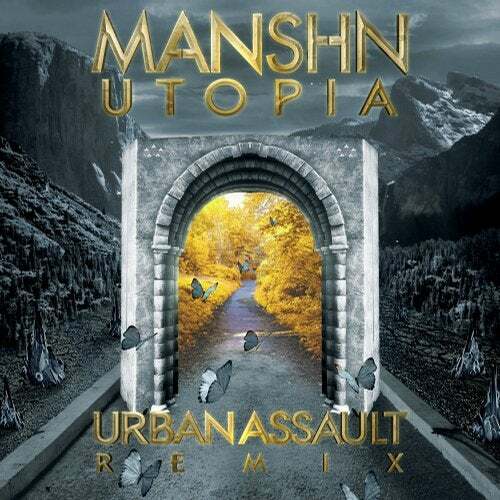 Final act, Urban Assault is back and showcasing their respective roots on MANSHN's "UTOPIA", a rawkus Drum&Bass dub engineered to level the clubs! Urban Assault a.k.a. the turntablism trailblazers Faust & Shortee have been pioneers in the electronic scene for decades producing and playing a wide variety of genres worldwide. On "UTOPIA", the duo serves up a tense smasher that smacks you at full force while throbbing bass stabs bounce like a heartbeat to a wave of rolling breaks! The great escape is here, take the time, let go and let's all sail to Utopia.